Alan Pardew believes Newcastle United are only guilty of being honest when the board state winning a cup is not a priority. He says this philosophy, so hated by the majority of supporters, is exactly what many other Premier League clubs are privately thinking but would never say in public. However, the United manager did insist he would field a strong team at Gillingham when the Capital One Cup campaign begins tonight. Newcastle’s open policy of not treating either domestic cup competition as seriously as the supporters would want has attracted much derision over the years. Pardew is possibly correct to say his own club are only telling the truth while others think the exact same way. However, the support want to see their club win a trophy more than anything and they will be heartened to hear Pardew telling them he is not taking a team made up of kids to the League One club. Pardew said: “Perhaps at board level we say what other boards don’t say – that is the Premier League is the be all and end all because of the television money. “You can’t hide from that and we have not hidden from it – we have actually said it, perhaps to our detriment. Pardew revealed losing to Cardiff City in the FA Cup third round last season still hurts him and he would use that as a motivational tool. 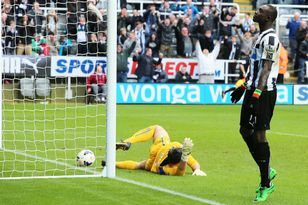 A number of big-name players were rested that day – top scorer Loic Remy began on the bench – and while Gillingham have not had a great start to their own season the manager would be taking a gamble if Siem de Jong, for example, was not given his first start. Pardew said: “I think one of the most disappointing games for me last year was Cardiff, when we should have won in the FA Cup and we lost it in the last eight or nine minutes. “That was our last cup game and we need to react to that and we need to get a win. “I will probably take the same 20 players I took Villa Park to Gillingham. “It is a difficult place, the atmosphere will be red hot. “They are a physical team but we are going to need to get a win. Pardew has a decision to make regarding who he starts with in terms of his strikers. He had hoped to give Ayoze Perez a run-out, but he is keen to keep faith with Emmanuel Riviere at Gillingham in the hope he will get his first goal for Newcastle. The £6million signing from Monaco has done well over the past two games, but without looking like scoring. Pardew is acutely aware if the transfer window does shut without another centre-forward coming in he needs the 24-year-old to start finding the net. Perez has looked okay as well, but it is likely to be the senior man who gets the nod for this cup tie. Steven Taylor will fill in for the suspended Mike Williamson, who was probably always going to miss out on this game. It may also be a chance for defenders Mapou Yanga-Mbiwa and Massadio Haidara to shine, while schemer Siem de Jong is in line for his first start after coming off the bench at Villa Park.